The 16-year-old already has racked up a cluttered trophy cabinet full of age-group domestic honours and has fond memories of the National Championships – last year she dumped out defending champion and top seed Liz Cann in the first round. 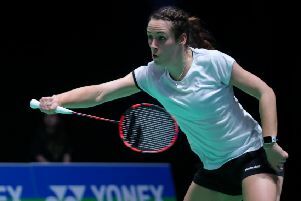 At Bolton Arena, she demonstrated why she’s so highly thought of in Badminton England circles, seeing off Viki Williams with ease in round one before cruising into the quarter-finals. In the last eight she gave last year’s defending champion Nicola Cerfontyne a run for her money before eventually going down 7-21 21-16 21-14 and Birch was happy with her singles showing, having sprung a few surprises. “I’m pleased with how the weekend has gone and I had some good matches in the singles and I think I performed well,” said Birch. “I’m still a lot younger than some of the other players and I’m still an under-17 and so to be out there playing in the seniors is just a great experience. Birch’s participation didn’t end there and it was in the mixed doubles where her education came. She teamed up with fellow rising Under-17s player Alex Lane and, while they overcome Gregory Mairs and Claire Weaver in round one and then Jamie Kilgariff and Raveesha Fernando in the second round, they met their match in Olympic silver medallist Nathan Robertson and Jenny Wallwork. The top seeds dispatched of the youngsters 21-5 21-9 but Birch still found positives in the defeat. “They’re a very good pair and obviously they beat us very comfortably but at times we played well so we’re not downhearted about it at all,” she added.